The new Wembley Stadium's signature arch could be lifted into place within weeks after its final section was welded together on Monday. 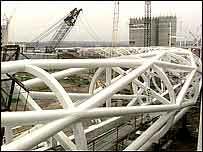 The 2,000 tonne, 315 metre-long steel arch replaces the Twin Towers as the iconic feature of the £757m stadium. Huge cranes will hoist the structure up over the next few weeks at the site in north-west London. Once it is complete, the arch will be the longest single roof structure in the world. 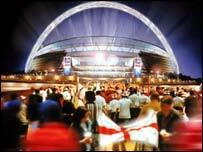 The new Wembley Stadium, which is being built on the site of the old stadium, should be completed in early 2006 and will seat 90,000 spectators. The placement of the arch could take several weeks as it will probably only be lifted at weekends to allow construction work on the rest of the site to continue during the week. It will stand 133 metres above the pitch and will support all the weight of the north roof and 60% of the weight of the retractable roof on the southern side. The arch, which has been built around the pitch, will stand at a slight angle when fully erected so as not to cast a shadow over the playing surface. The roof will be connected to the arch, which is the length of three football pitches, by giant cables ensuring there are no pillars which could obstruct the view of fans. It will enable the new stadium's roof to slide back, uncovering the seats and allowing more rain and sunshine on to the pitch to keep it in good condition. Football Association spokesman Nick Barron said: "The arch is going to be a landmark for football and a landmark for London." The much-delayed deal for the new Wembley was only agreed in September 2002 and it will be one of the most expensive stadiums in the world. Around £161m of the cost of the £757m cost will come from public funds, including £120m of lottery cash. "The all new Wembley Stadium is taking shape"